That was the first one that I fell in love with! We really have the same taste. 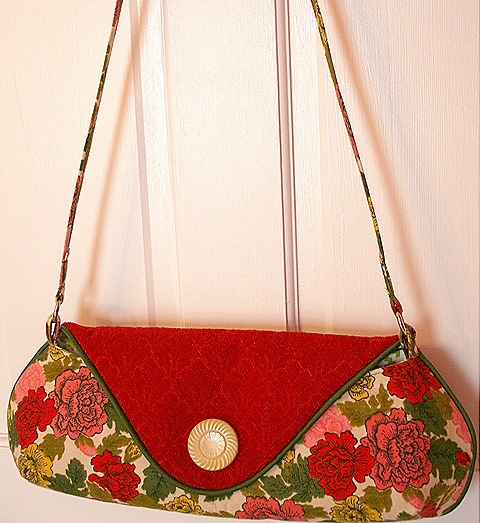 I especially liked that it could be made into a clutch…so is there any possibility that I could get one made for me? BEAUTIFUL!! I don’t blame you one bit for keeping it!! Very cool! That one is stunning………….come to think of it, they all are!! Have a great holiday weekend – bet you are going treasure hunting!!! Don’t blame you one bit! I’d keep it too! That is really pretty, Suzy! P.S. The uke sold for $368.51 Woohoo! Oh my Gosh! That’s stinkin’ fabulous!!!!! I knew you’d make something fabulous with that fabric! You have to keep it…it’s perfection! Now make some more so we can all have one. That is elegant.. wish to have one as beautiful as that. 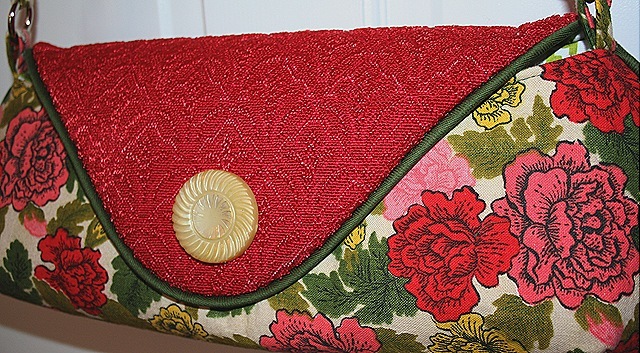 That vintage red fabric is called nylon “frieze”, I recently learned – gorgeous.